The Honey Bee has been around for over one hundred million years. During this time, like all insects, pests and humans differing bacteria, fungus’s, viruses and other onslaughts have transpired. Some have been obliterated or moved on. The Secretary of Agriculture, in 1922 instituted a ban on the importation of all honey bees due to the Tracheal Mite which has since become a non-issue. American Foulbrood, over the years, another honey bee disease, has also proven a significant issue. Yet, with extensive education exposure toward beekeepers, it now has fallen to a low level of incidence. Today, and for the past thirty years, the Varroa Destructor Mite has risen to the number one cause of honey bee loss. In the late eighties and early nineties colony loss was reported in the sixty to seventy percentile levels. This dramatic challenge to an essential pollinator brought significant attention to the six-legged insect. Entomology Departments shifted focus from other insects toward the Honey Bee and this devastating pest. 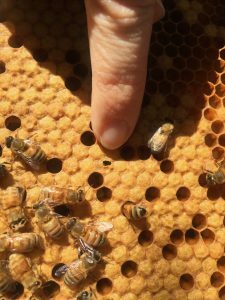 Although multiple Acaricides have been developed and passed both Federal and State EPA certifications, the pest has continued to stress beekeepers throughout the world. Australia, once reported to be the only country without mites has recently reported hives having sightings of the pest. 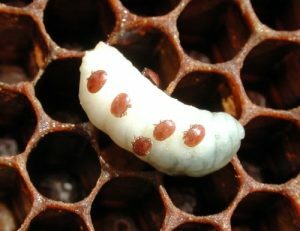 The Varroa Destructor Mite begins its life in the Brood Cells of the Honey Bee. 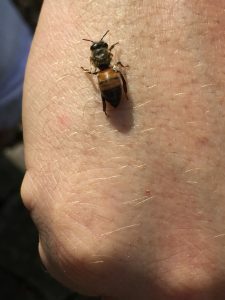 The mother mite enters the cell just before it is capped to continue the growth of its pupal stage through to the bee emerging from its cocoon to become an adult bee. Unfortunately, along with the hatching of the bee, the mother and one or two daughters also emerge. The Queen Bee, during the months of April through August lay 1,500 to 2,000 eggs. As the mite is able to bring about a mother and at least one daughter from every cell, that becomes 3,000 mites coming into the hive daily. The Varroa Destructor Mite forms a “pest-host” relationship with the honey bee. Recent research has reported the mite consumes the fatty tissue of the bee. If this were not a sufficient onslaught, the mite also has proven an exceptional vector of viruses. Honey Bee viruses have been evident pre-mite, but similar to the mosquito’s ability to transmit deadly viruses to humans, so also has the mite brought deadly viruses to the bee. Viruses are a tricky lot in that there does not exist any viable treatment regime. The most formative virus for the honey bee is the Deformed Wing Virus which is evidenced with the wings of the bee seen as gnawed leaving the insect unable to fly. Elimination of the mite diminishes the effects of the viruses. The good news, if there is any in this saga, is the reports that continue from the USDA which offers ‘self-reported’ colonies to be at a level strength or a bit of a rise. This is coupled by reports from Bee Informed Organization reporting for the period October 1, 2017 through April 2018 a loss of 30.7%. This represents an increase of 9.5% over the previous year’s reporting. In comparison to the past 10-year average it represents a 2.8% increase. But, like all statistics, one must look closely to the numbers and how they are developed. Bee Informed, among its varied duties, samples commercial hives throughout the United States monthly during the bee season (January through November). This direct sampling provides most reliable information and statistics. The annual survey conducted by Bee Informed is separated into three management categories: Backyard, Sideliner (less than 30 hives) and Commercial. The Backyard Beekeeper has the highest loss rate. In comparing the Commercial to the Backyard Beekeeper, one has to view the orchardist to the home gardener. Both seek success in their efforts, yet one has a plethora of tools and experience to draw from. So it is with the Backyard Beekeeper. No matter what side of beekeeping the beekeeper resides within, it is clear the war against the Varroa Destructor Mite still ensues. Some treatments have proven to have developed resistance. Of greatest concern to the honey bee is a lack of consistent monitoring coupled with a viable plan to mitigate the offending pest. Many a beekeeper has closed the season in depression as they witnessed hive losses. 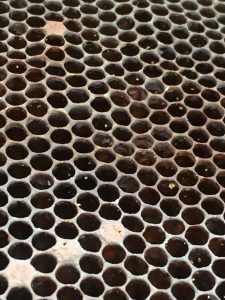 Until the beekeeping community, both backyard and commercial, come to grips with this crisis, bees will continue to suffer. With the number of colonies holding their own yet levels of losses taking a slight increase, it is evident more aggressive educational exposure and management plans must be instilled. Thirty years of destruction may prove to extend for many years to come without a significant change.